The traditional Maibaum is the centre of Bavarian Culture on May 1st in Putzbrunn, Germany, Europe. For weeks prior to the May 1st Maibaum celebrations a 34 metre long tree (the Maibaum) is prepared for the event in keeping with Bavarian Culture. The Maibaum is the centre of attention for the festival, and is therefore prepared and painted in the traditional Bavarian colours of blue and white according to Bavarian culture. The colours are representative of the blue sky and white clouds above Bavaria. This maibaum belongs to the village of Putzbrunn in Southern Bavaria near Munich in Germany, and is ready to be wheeled into position by a team of men while led by a brass band and traditionally clothed women. 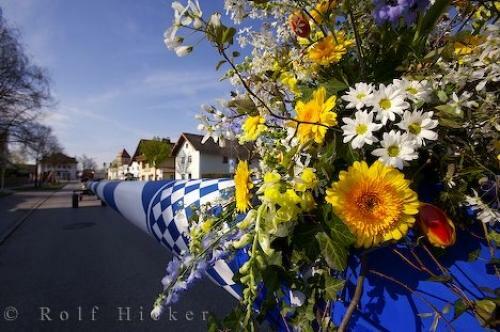 Picture of a floral arrangement sitting on the painted Maibaum in the Village of Putzbrunn, Germany, Europe.